Whole grain can be a real food in your diet and is a staple in many peoples. But the word whole in whole grain can be confusing. Here I talk about what whole really means in a real food diet. The use of the term whole when describing food has skyrocketed. You see "whole" all over food packages, in ingredients lists, in ads. But does whole food really = healthier, real food? Sometimes yes, sometimes no. At least in the case of whole grains it is a bit easier. The term whole grain means that all parts of the grain were used. Because all parts were used, you will get more vitamins, minerals, and fatty acids with a whole grain over a processed grain. 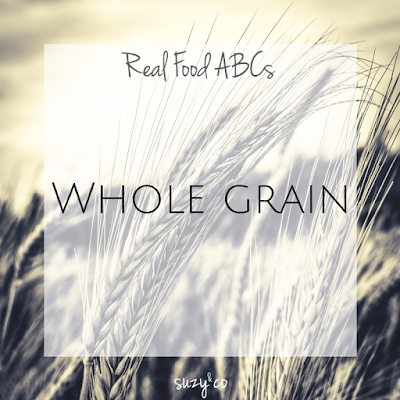 Whole grain includes wheat, along with rye, spelt, millet, corn and many more. But sometimes on a food package you will see the term Multi-grain, 7 grain, maybe 12 grain. None of those terms guarantee the whole grain was used. That is when it is important to read the ingredients list. The ingredients list should still say whole grain, otherwise it is not. The other thing to remember is that ingredients lists are always listed from most to least by weight. So something made with whole grains could have 10 other ingredients first, including white flour. Just because something is made with whole grain, it doesn't mean that it has a lot. And just for fun, a created a quick slideshare presentation on the term "whole." Feel free to share it.